Author: Josh Strauss, who works for Valhalla Pure Outfitters Abbotsford. What stove should I get? Which one boils faster? Which one is the lightest? These are just some of the questions you might have when looking for your first stove. And narrowing it down can be hard, especially since there are well over a dozen different options to choose from. There are a few things to look at before you start worrying about how many grams it may weigh or how expensive it might be, even though those things are still important. Every stove has its pros and cons and how you plan on using it will determine which one will be best for you. If you are looking for inspiration and knowledge about backpacking food, have a look at our post Eating better on the trail. 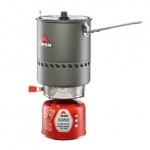 Stoves are mainly split up into two categories: Liquid fuel stoves and canister fuel stoves. Liquid fuel stoves use white gas mainly, with the exception of a few models that can switch out to take all sorts of liquid fuel such as kerosene and gasoline, etc. 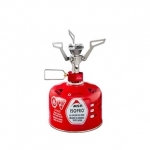 Canister fuel stoves use a pressurized canister mainly filled with an Isobutane/ Propane mix where the cheaper, less efficient canisters, use normal Butane/ Propane. 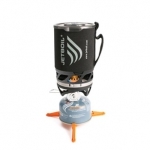 The first advantage of a liquid fuel stove is the fuel itself. The white gas that all liquid fuel stoves run on has little to no impurities, making it a super clean and hot burn. 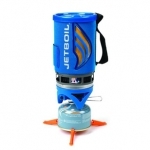 It also performs really well in below freezing and high altitude conditions because of the pump that allows you to control the pressure, making it the more obvious choice for winter backcountry trips. This fuel comes with the added bonus that it is the cheaper fuel when compared ounce to ounce with canister fuel. Some liquid fuel stoves can also burn multiple other types of fuel such as kerosene, gasoline, propane, canister fuel, etc. which is a huge advantage to trekking in developing countries where common fuels we have here in North America such as white gas and isobutene mixtures are a lot harder to find. 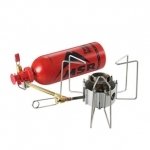 Stoves such as the MSR XGK EX or Whisperlite Universal would have you covered in these situations because they can burn pretty much any type of fuel. Liquid fuel stoves also have a slight advantage when it comes to cooking for a larger group of people, the main advantage being the size and stability of the stove for larger pots and pans. This doesn’t mean they are big and clunky however, some can fold down just as small as canister stoves. 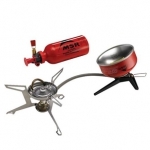 Liquid fuel stoves such as the MSR Dragonfly or Whisperlite International are good examples of stoves with big stovetops to hold bigger pots and pans. They are also excellent for the more gourmet backpackers who like to cook their food on the spot rather than just boiling water for freeze-dried food. 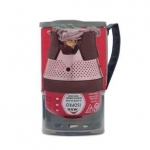 The main disadvantage to liquid fuel stoves is the usability. These stoves aren’t as easy as plugging in and turning on like most canister stoves; they take a little more practice and attention. After assembling the line from your stove to your fuel pump you must then “prime” or preheat the stove before it is ready to start cooking. This basically means you need to pump and pressurize the fuel so it is ready to feed through the line and burn through the stove. It ‘s a more hands on, time consuming process, but necessary and valuable for the performance and fuel efficiency. 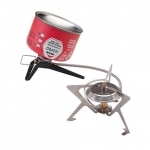 Canister fuel stoves use fuel canisters with a mixture of approximately 80% Isobutane and 20% Propane. That ratio will be a little different depending on what brand you choose. Propane can boil at much colder temperatures than Isobutane but requires a much heavier canister to hold the pressure, which is why it’s mixed with Isobutane to get the weight of the canister down while still holding a good boiling temperature. This is where canister fuel stoves get their first flaw. In cold conditions, Isobutane doesn’t burn well but propane does. 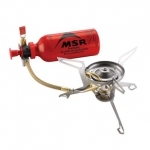 Sooner or later all the propane will be used and you’ll be left with a canister of isobutane which is unusable when freezing (although some higher end canister stoves such as the MSR Reactor has a regulator that helps maintain better pressure even in colder conditions). This problem can be remedied by keeping a canister in your sleeping bag or in your jacket to warm it up. 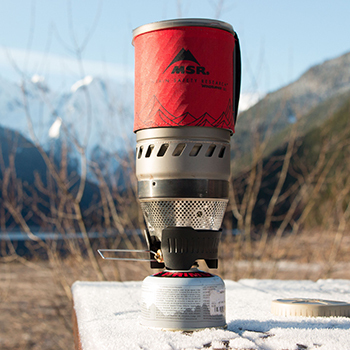 One big advantage of a canister fuel stove is the ease of use. All that is required is to screw the stove to the canister that doubles as a pot stand and voila! It’s all ready to go. The last thing I want to do after a long day of trekking is spend time priming my stove and pumping the fuel before I can start cooking dinner. 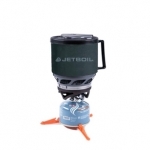 Canister stoves such as Jetboil and the MSR Windburner and Reactor have taken ease of use and fuel efficiency to the next level with their integrated pot systems that cut down the distance between the stove and the pot, and include built in windscreens to block out the weather. Boil times for these stoves are the fastest you will find. They however shouldn’t be used for much more than boiling water just because of how hot the stove gets along with how thin the pots are. Any attempt at actually cooking in these stoves will result in burning the food with the chance of ruining the pot and stove as well. 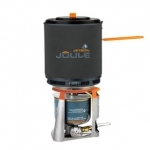 These quick boilers are most popular with people who rehydrate freeze-dried food and make coffee. 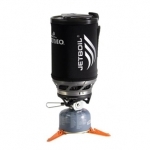 This is the kind of backpacker that I am and I own both a Jetboil and Windburner and love them! Super quick to boil, fuel efficient, and easy to pack and store. 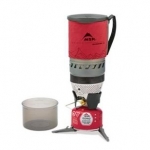 Other canister stoves include the less fuel efficient but much lighter options such as Primus’ Classic Trail stove (available at VPO Abbotsford) and MSR PocketRocket weighing in at just over 3oz. The obvious advantage here is the weight. The slight disadvantage is still fuel efficiency. 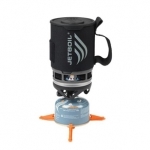 These ultralight stoves will be more susceptible to wind and other factors just because of the open space from the element to the stove meaning you will burn through more fuel unlike the Windburner or Jetboil. 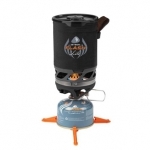 These stoves are the perfect option for anybody who is just getting into backpacking or trying to cut down on weight for less extreme conditions. I hope this information has helped you narrow down some of the choices you have to exactly what you might need. Good luck on your upcoming adventures! 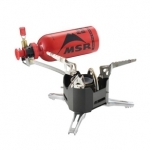 I’ve been using my MSR Windburner for nearly a year now and really love it! As for cooking with it, I tested the Windburner Skillet (https://vpo.ca/product/293192/windburner-skillet) this weekend during an overnight at Wedgemount Lake… So good to cook some eggs&bacon in the mountain 🙂 And it’s also perfect to make coffee! Only cons I see so far is the cost of every additional accessory. Not all liquid fuel stoves burn white gas. Some use alcohol, of which Trangia is the most popular, I think. I like my silent Trangia.